UMBC has allowed me to reinvent myself multiple times… I couldn’t be more appreciative or thankful for the opportunities to study my work and wear so many hats in my 21 years at UMBC. John Fritz has worn several hats at UMBC over the last 21 years, and he credits the university with enabling him to reinvent himself and to grow through multiple careers. After Fritz began working at UMBC in 1995, he transitioned from working in public relations to information technology. His curiosity and thirst for knowledge led him to pursue his Ph.D. to study if technology, particularly the Learning Management System he was overseeing, could inform students through data analytics that help improve their academic success. Fritz’s daughter Zoe is currently a sophomore at UMBC, and his wife Dawn earned her master’s degree in teaching at UMBC in 2008. John shares that earning his Ph.D. has been one of the most rewarding things he has ever accomplished and is proud to begin UMBC’s 50th anniversary year as both a leader in UMBC’s administration and an alumnus. 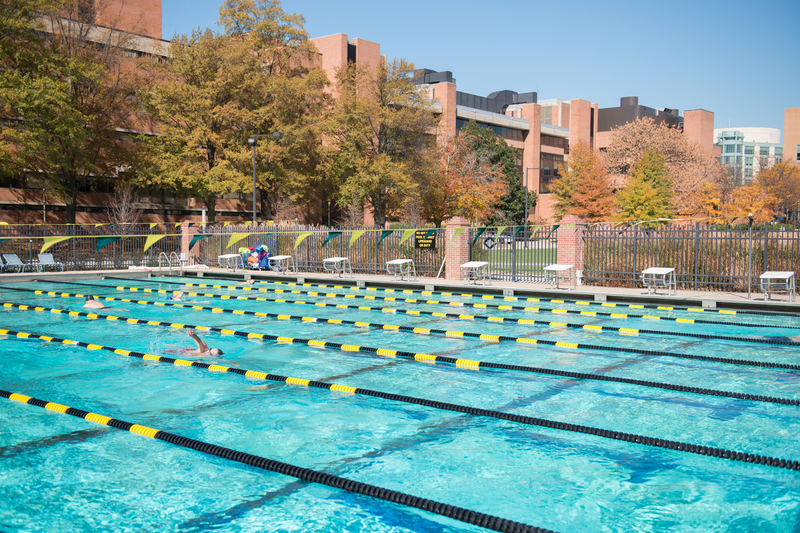 Images: UMBC’s outdoor pool, where throughout his time as a student, employee, and even now as a parent, Fritz spends time swimming laps, which he says has been a great stress reliever and think tank to sort through issues and opportunities. Photos by Marlayna Demond ‘11 for UMBC.